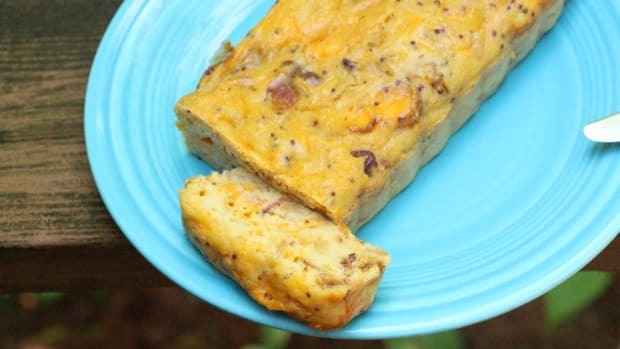 Dicing is one of those kitchen techniques that completely changes the way you approach a recipe. 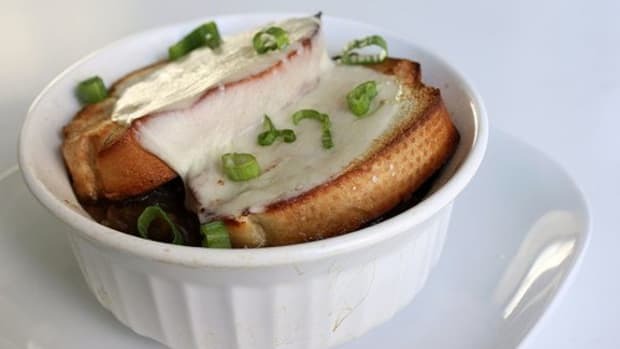 Dicing involves a touch of skill, but once you know how to do dice an onion, every vegetable you add to your favorite soup, salad or stew will be the same perfect size, solving a variety of problems from undercooked veggies and overcooked mush due to size discrepancies or unpleasant mouthfeel due to pieces that are just too big. 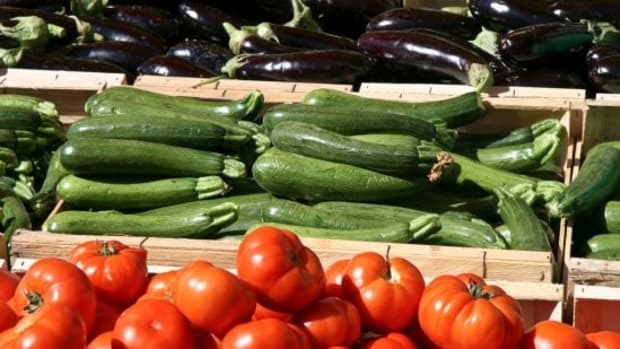 You don&apos;t need to be a trained chef to know how to dice an onion, and best of all, once you&apos;ve learned this technique, it can be applied to all manner of vegetables: onions, shallots, peppers, potatoes, tomatoes, carrots... the sky&apos;s the limit! 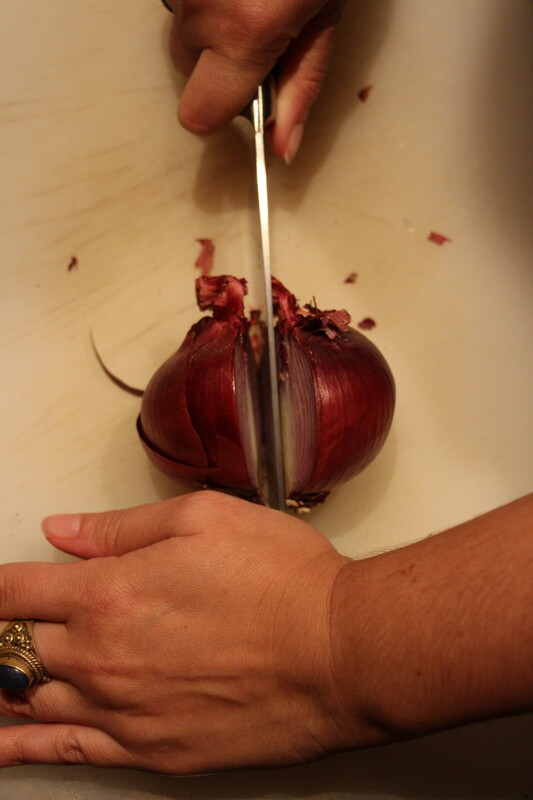 Start things off by cutting the onion in half from root to tip. 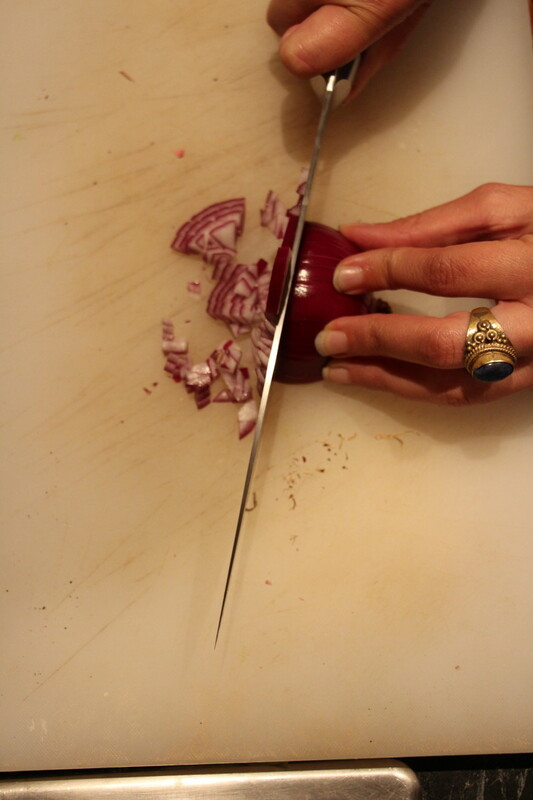 If you need to add extra pressure, as you often will with onion, place your non-cutting hand on the top of the blade and push down. 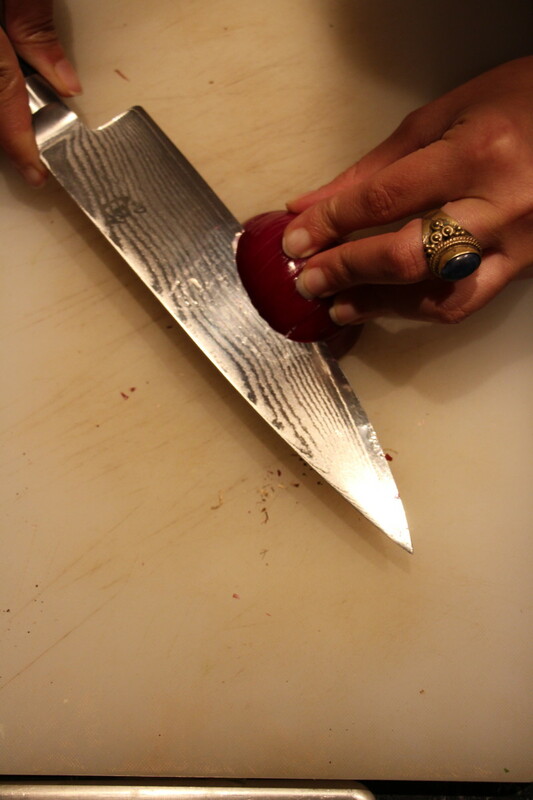 Having a well-sharpened knife will help make sure that you get two even halves. 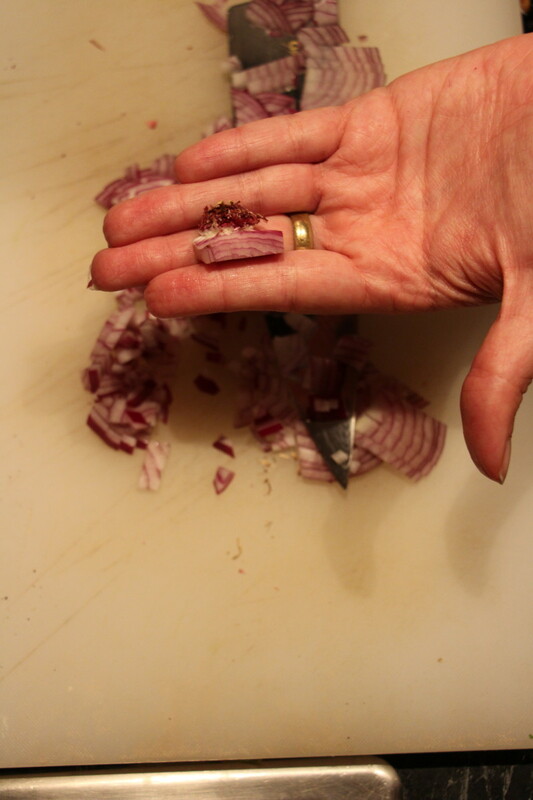 Remove the tip end of the onion (not the root end), but don&apos;t throw this away! 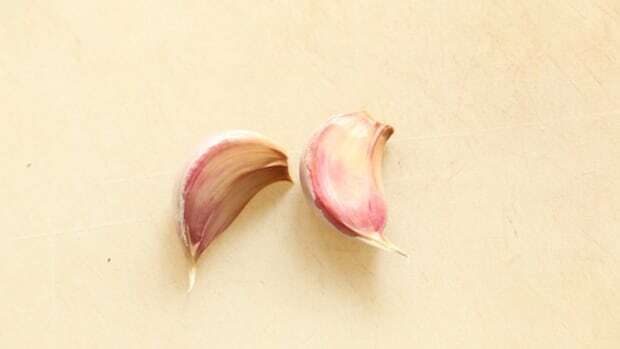 It&apos;s perfect to save and add to stocks for flavoring. If you don&apos;t have a stock in process, stick any and all scraps into a plastic bag and freeze them for the next time you make a homemade chicken or vegetable stock. 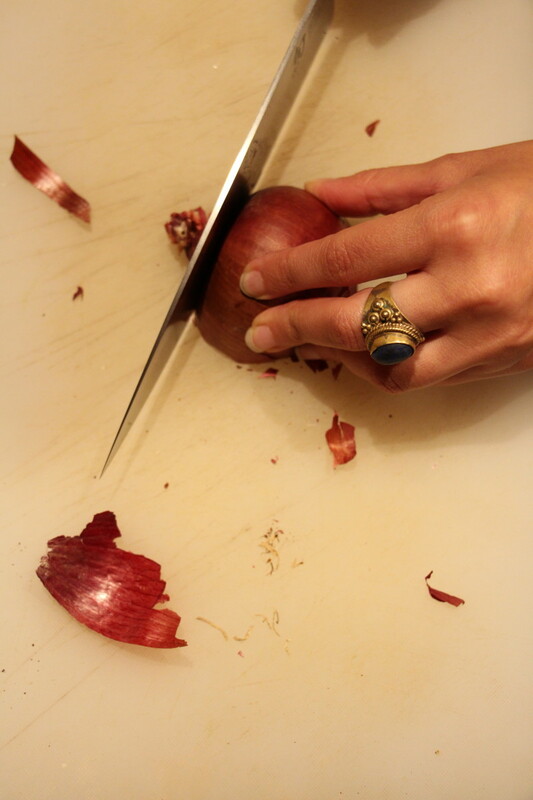 Start peeling the onion, starting at the cut end where you removed the tip. 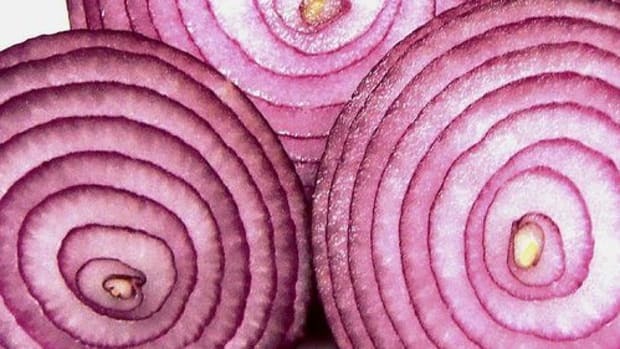 If you&apos;re wont to cry when peeling an onion, try a few of these tips! 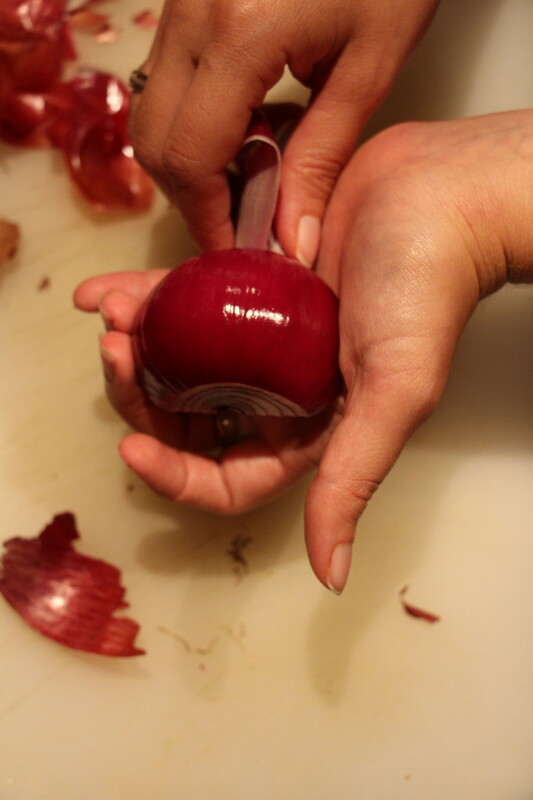 When the onion is peeled, all of the skin and dry outer layers should be completely removed, but the root end should still be in tact. Place the onion flat on your board, holding it down with your fingertips. 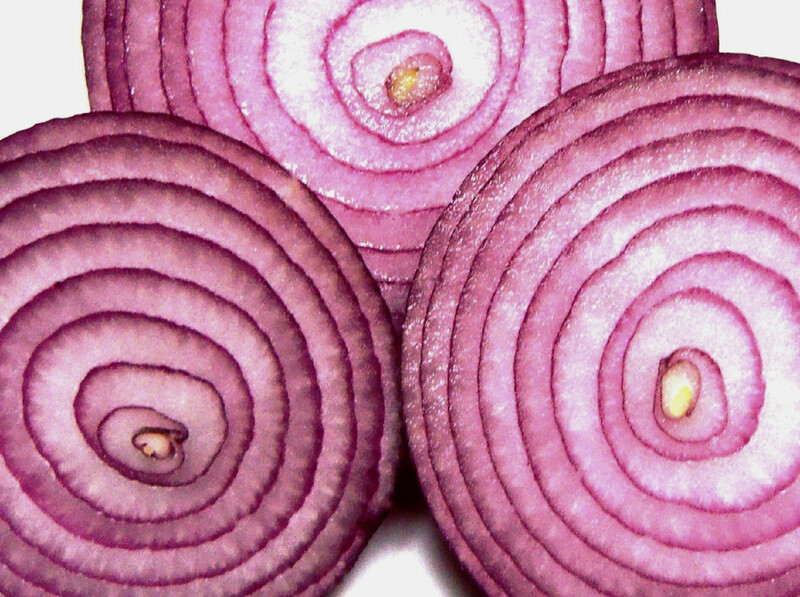 Begin slicing lines through the onion up to the root. 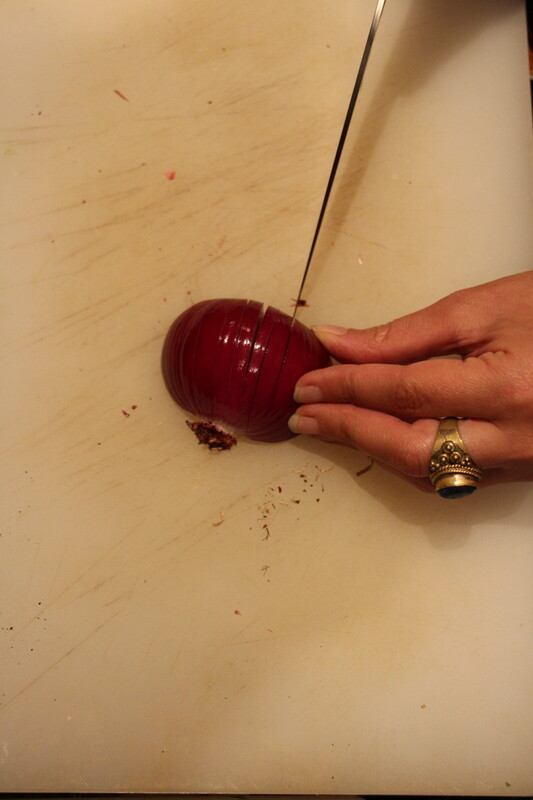 The root will hold the different pieces of onion together until you begin the dice. Try to keep the lines fairly regularly spaced. The more closely spaced the lines are, the finer your dice will be. 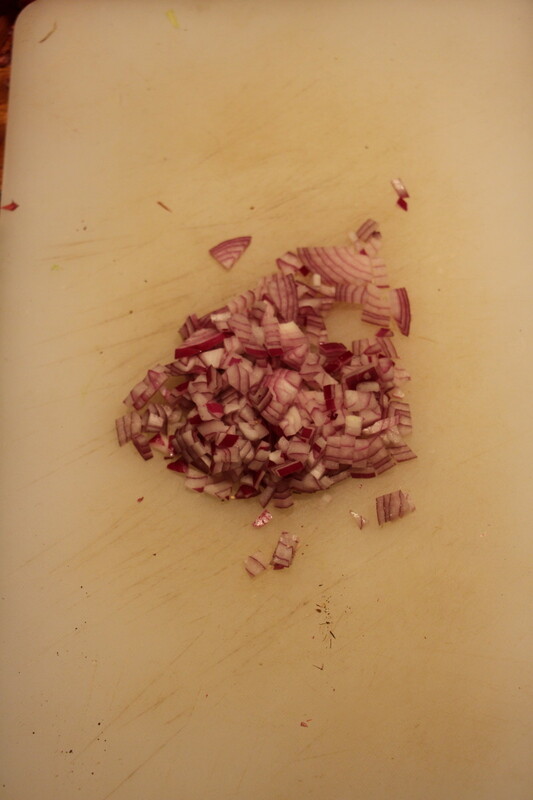 When you have cut lines through the whole onion, cut two or three lines into the onion widthwise. 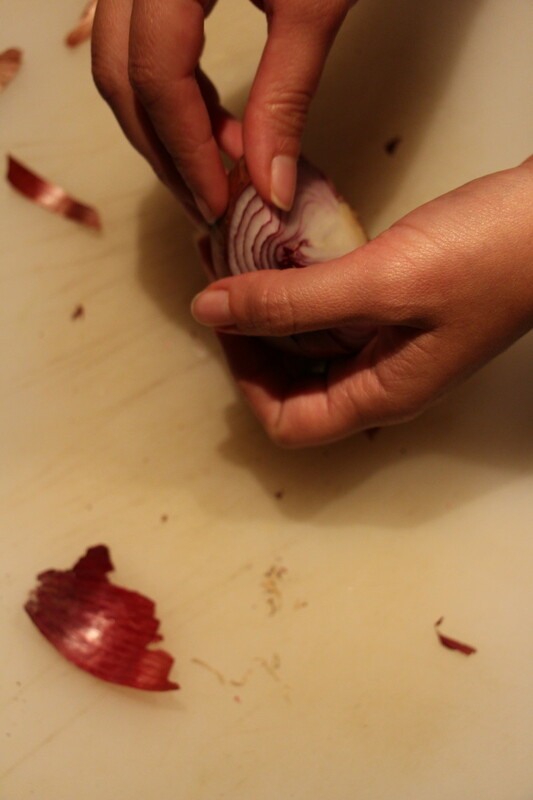 This is where the onion will start to be a bit hard to hold together, but cutting these extra lines will help give you more even pieces. 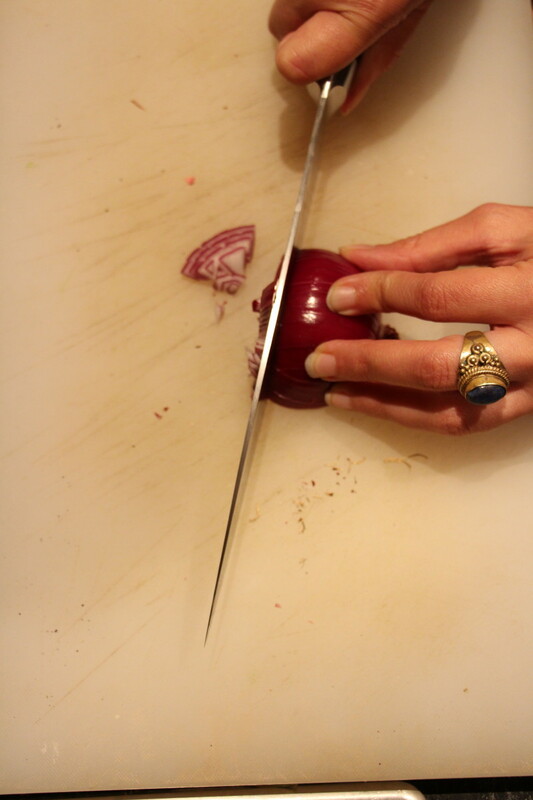 Position your knife on the board and begin cutting, using a chop and slice motion. 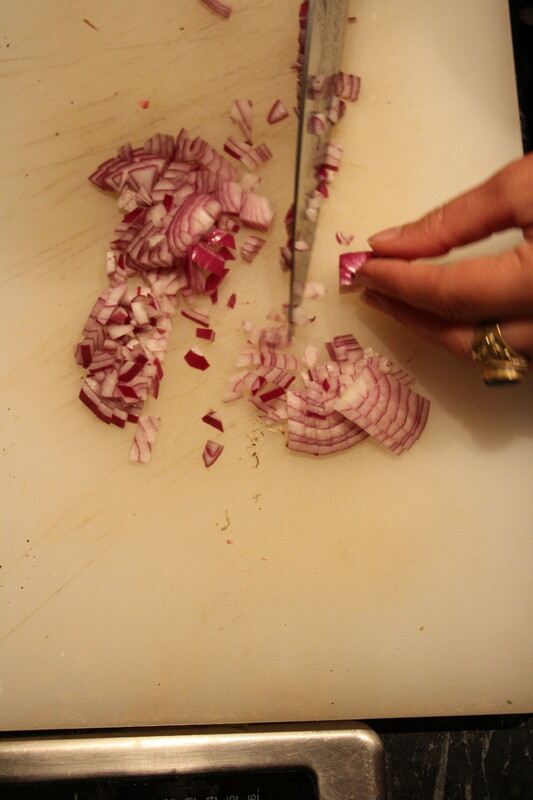 Begin with the tip of your knife on the board and the blade placed over the onion. 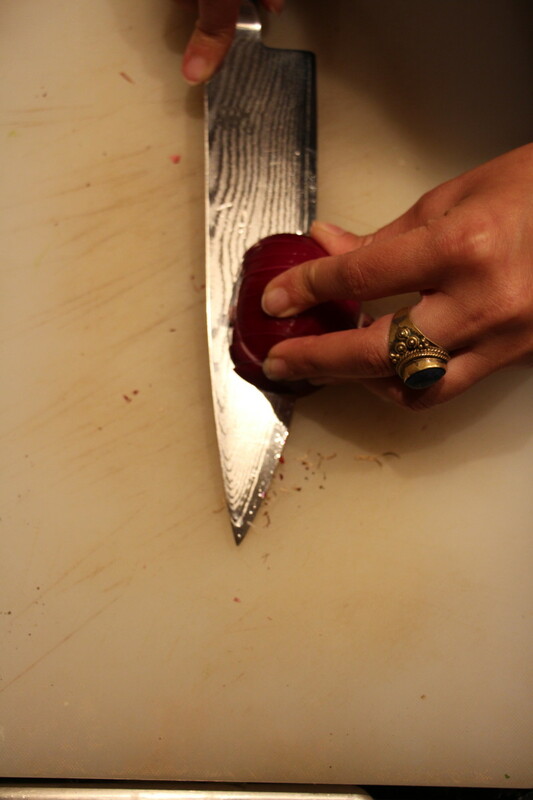 Chop downwards and slice by pushing the knife away from you along the board. This will ensure easy, precise cuts. 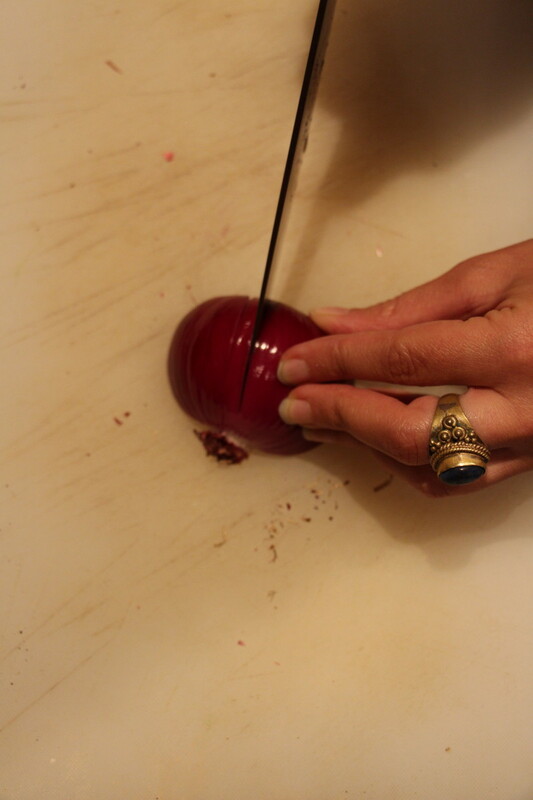 Continue cutting, moving the fingers you are using to stabilize the onion back further as you go, to make sure that you don&apos;t cut yourself! 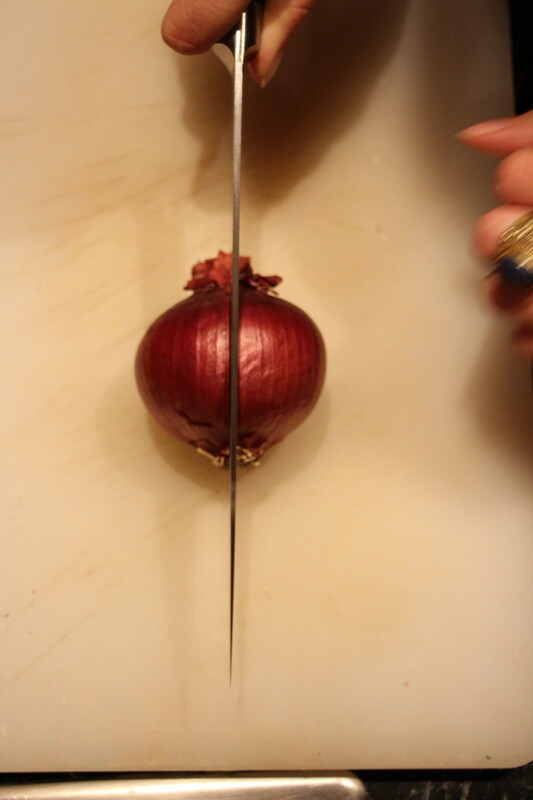 When you get to the root end, turn it so that the cut end is on the board and cut the onion from either side into a dice the same size. Save this piece for your stock! 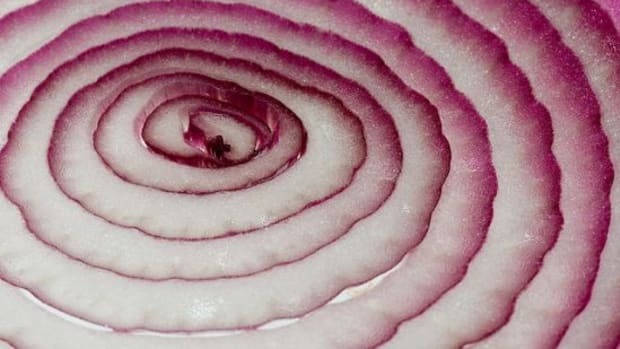 Your onion is ready to be used! 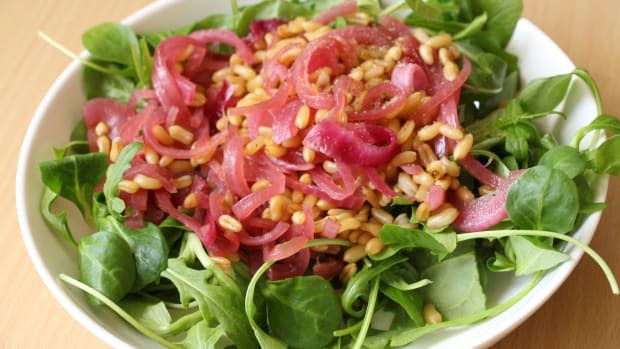 This is a fairly fine dice, which is ideal for salads as well as sauces and soups that won&apos;t be puréed or cooked for a very long time, like this lentil soup. For onions that will cook quite a while or get puréed at the end of cooking, like this vegan fennel soup, you might want to cut your dice a bit larger. 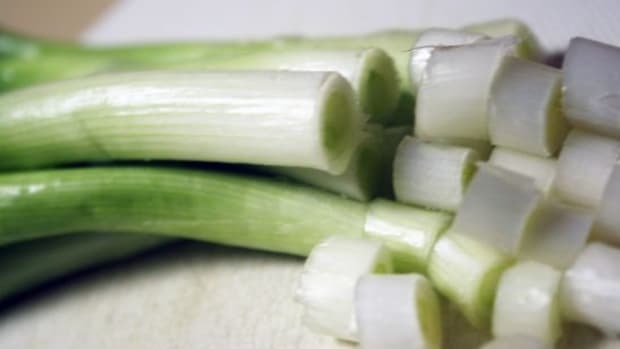 Scallions, Green Onions, Spring Onions: What's What? !